News | HUND MÖBELWERKE | Orgatec 2016 - Rethinking works. Creativity works. This was the slogan at this year´s Orgatec office furniture show in Cologne. The exhibitors did very well to stimulate the interest and excitement of the visitors, making it a successful happening of office furniture industry. 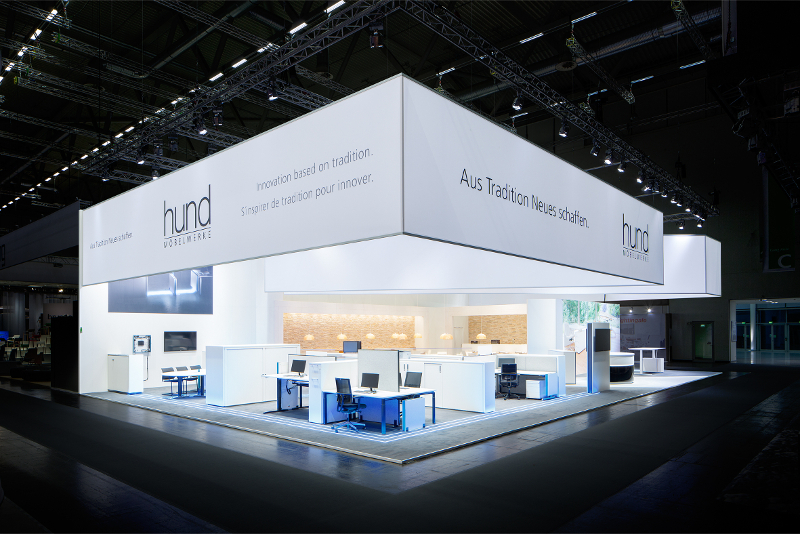 And we as Hund Möbelwerke also delivered a good and impressive show of products in Cologne. The growing importance of digitization, networking and communication at work has played an important role in developing our new product range. These trends are closely linked to a growing demand in IT-infrastructure and data security. To meet those demands we developed a new innovative product range: ENERCON. A clean cable and data management is now possible without the office furniture losing its independence. The workplace thus is becoming more and more a centre of communication fulfilling demands in ergonomics, design and individuality. With M-Move we presented another highlight of our trade fair performance. M-Move stands for top design from the Black Forest. The electrically height adjustable desk on M-Line basis convinces with a combination of the typical M-Line exclusivity and the every-day feature of an electrical height adjustment. The catering area showed that we do not only produce standard office furniture, but that we also offer a clear added-value with our customized, individual solutions often combined with an exquisite material combination. See us as we do see ourselves: A manufacturer with a product range that makes the modern way of working more ergonomic, more functional and more stylish.